Massage provides relief to people from all walks of life. The athlete, the gardener, the overstressed executive or housewife... secretaries, laborers, waitresses, teachers... senior citizens, the bedridden - anyone can feel a need for a massage. Massage helps relief stress, which can improve your vitality and state of mind. If you suffer from chronic ailments, massage can relieve pain and help heal. What can I expect when I have a professional massage? Your session will be conducted by a certified massage therapist, who has received training in a variety of techniques. Your massage session will take place in a warm, comfortable, quiet room. Soft music may be played to help you relax. You will lie on a table specially designed for your comfort. A typical full body massage session includes work on your back, arms, legs, feet, hands, head, neck, and shoulders. You will be properly draped during the session. Only the area being worked on will be exposed. Make yourself comfortable. The practitioner will gently move you or suggest what is needed throughout the session. Some close their eyes and relax, others like to talk. Feel free to ask questions about massage and the techniques you are receiving. Most people feel very relaxed. Some experience freedom from long-term aches and pains developed from tension or repetitive activity. After an initial period of feeling "slowed down", people often experience increased energy, heightened awareness, and greater productivity which can last for days. Studies have shown that Reiki can be extremely helpful to those battling cancer and the side effects of traditional treatments. Other secondary symptoms such as anxiety, depression, and pain can also be treated with Reiki. We can enhance productivity in the workplace by bringing massage therapy to your office! 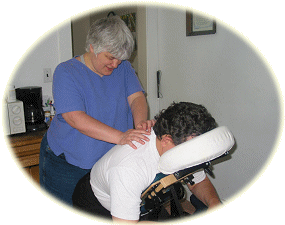 Chair Massage is a mobile service providing upper body massage - on location. All your staff can benefit from a relaxing session in a massage chair. Healing Song Therapeutic Massage creates custom blend lotions, oils, sprays, and scrubs for the specific "tastes" of each individual. Please email us for a list of fragrances. My husband had a sweet habit of getting me massage and spa gift certificates for special occasions...and I had a horrible habit of not using them. He knew I needed some kneading due to my stressful job, yet at least 4 spa-related gifts went unused. I think it was partly me being intimidated by bigger chains and also being a bit self-conscious (I am no super model!). In what probably would have been his last attempt, he got me a workplace chair massage from Healing Song Therapeutic Massage. He thought it would be nice to have someone to relieve me from my stressful project work life with a nice back rub. 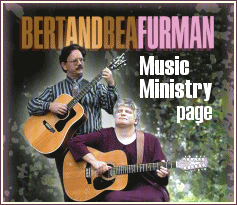 Skeptical, I went to the Healing Song website and was surprised to see a person who looked not unlike me...normal. Very down to earth and not at all intimidating. The overall feeling from the website was very inviting. So for the first time ever, I set up an appointment for a massage (Bonus: I was able to swap out the work visit/chair massage for a normal massage). That was nearly 5 years ago and I am still coming to Bea Furman twice a month for my full-body massage. I even moved out of state for a couple of years but maintained my visits when I traveled back to Jackson for work every month. Bea has become as much a friend as a CMT and her great personality is just gravy on top of a great massage. Highly recommended, give her a call...you won't be disappointed! I highly recommend Bea Furman as a massage therapist. I have been one of her monthly clients for over 10 years. I have not missed my monthly appointment more than three times in 10 years. I originally obtained a Healing Song gift massage from a fundraiser and planned on enjoying a pampering half hour for myself! Soon after I obtained the certificate I developed fasciitis in my left foot. Between physical therapy and sessions with Bea, I was able to recover a lot sooner I'm sure, because of the extra attention she gave to breaking up the fascia in my heel. Now I continue to go for the pampering of my whole my body! I have been seeing Bea for over 2 years now 3-4 times a month as a way of managing my chronic fatigue, insomnia and the stress that goes with these conditions. I have been able to get my life back (sleeping, working, socializing) due to her massages and energy work. This woman has magic in her hands!. I will be forever grateful to have added her to my wellness plan. Bea provides a healing massage combining both healing energy work along with a therapeutic massage. She has a gentle, yet firm touch and is well skilled for healing a wide variety of physical ailments. In addition, she has a cheerful disposition and a caring heart. If you are looking for a massage therapist I strongly recommend you give her a call. I have found that I am so relaxed when I have a massage done by Bea that I could easily fall asleep on the massage table. My wife has actually fallen asleep while being the recipient of the massage. A great, relaxing massage! I am deafblind and a very busy woman. I have experienced the pleasure of massage therapy with Bea. Having had other massage therapy experiences that were not pleasurable (those that have left me feeling much worse than before the massage). I have come to realize the importance of a skilled therapeutic massage executed by a professional, trained individual. Beyond her professionalism, I find that Bea truly cares about each individual, their health, their circumstances - mind body and spirit. She is not only dedicated to her profession but she has volunteered numerous hours to the Michigan DeafBlind Workshop that is annually and is, simply stated, one of the best!!! I have known Bea for the last two years and have been having her come in and provide my nursing home residents with a "Pamper Session" of hand and neck massages. I am impressed with her calming nature and knowledge base of different therapeutic touch and relaxation techniques. She is willing to stay an extra few minutes to get the last one or two residents in for a massage and her gentle touch is so soothing to achy joints and arthritic hands. I highly recommend Bea and her healing touch if you're in need of a good massage!